Customers learn about Industry 4.0 solutions at Biesse Canada event. 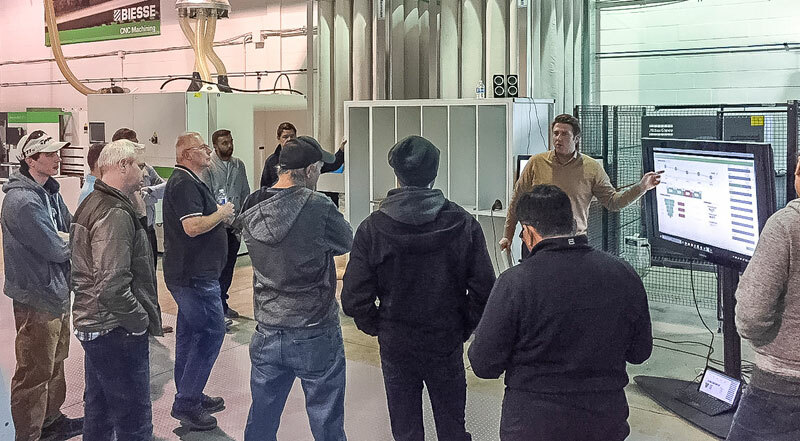 “It was a great opportunity to partner with WEB-CAB, which is at the forefront of 4.0 with medium-sized companies, and to allow those sized companies to see how they can inter-connect multiple machines and monitor the factory process flow,” said Matt Fleming, Biesse Canada’s vice president of sales. With Industry 4.0 solutions no longer reserved only for large manufacturers, small-to-medium sized shops that still produce floor stock based on how they’ve traditionally cut or drilled panels are realizing there is a better process available. “It’s all about helping your business increase efficiencies while reducing inventory,” Fleming said. In partnership with WEB-CAB, Biesse Canada is helping show smaller companies that wouldn’t have the chance to regularly see this technology, how it works to improve their bottom line with Biesse machines they’ve already purchased.